It had to happen eventually, Given to Sound and The Script had to cross paths at some point. In writing about music on this site, we like to think we only pick that which moves us, music that sends a shiver down your spine, puts tingles in your toes or makes you turn the volume up and dance around like a lunatic. In searching for such material, we find that phrases such as ‘your Dad plays this endlessly in the car’, are big red danger signs telling us to stay away. But The Script just wouldn’t go away. The Man Who Can’t Be Moved moves some people, Breakeven was nice enough, but breaking up doesn’t have to sound so polished and presentable. If, as Danny O’Donoghue sings, he is falling to pieces, maybe find a bad bar and a good bottle of Jack, not a slice of cake and a vimto. 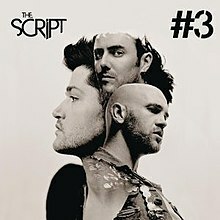 This month saw the release of the band’s third album, #3. It opens with Good Ol’ Days and finds Danny singing about heroin darts and whiskey (maybe he listened and put down the vimto, oooooh the rebel), it has wooohooo’s and it’s a bit rappy. In the future these’ll be the good ol days; children of the future if you are listening to music, this is a message from the past so listen and listen good: The Script? These aren’t the good old days, not even close. Now be a good little droid and go down to HMV and ask your for a musical chip version of The White Album, Born to Run, Rubber Soul or anything written by Noel Gallagher. Six Degrees of Separation is about the singer’s real life break up and is lyrically very strong and will speak to some out there about the truth of painting on fake smiles and telling the world you are okay when you aren’t. At some points the song ventures as far into edgy as we are going to get from this band, there’s swear words in the verses. F words, no less. Vocally the same traits are there and at the end of the lines, Danny adds a ‘yeah’ once or twice, which is fine but if you have seen David Brent’s Free Love Free Way during that episode of The Office, it’s the same sound. We declare a ceasefire on knocking this band here, their empty lyrics and glossy production might well kill any chance of feeling real emotion and believing in what they are singing but here they have it. When they stop with the boyfriend girlfriend breaky uppy nonsense and write about something like this you can feel it and you can forgive anything, this feels real. We applaud them for putting this out there, completely. OK, gloves off again… chimey pianos, lyrics about leaving or being left and about as much edge as when you child proof the tables so toddlers don’t fall and hurt themselves. (Glowing), Give the Love Around is peace and love, it tries to be a little bit Where Is The Love, but it’s a bit too hands around the world for us. If you want to get your kumbaya-yas out it’s fine I suppose. Kaleidoscope is a good catchy tune and borrows a little from bigger better bands; a dash of Colplay and half a bottle of U2 (Danny does a Bono sound-alike here, tries to at least). All in all The Script are not the kind of band that will inspire kids to plug in guitars and start their own bands, they will however inspire kids to get over their school crushes, inspire older kids to lie in a duvet eating chocolate and wailing about the love of their lives. This music will inspire parents to think they are down with the youngsters. There is nothing wrong with that at all, if you want that from your music then The Script do it very well. It may be real life, and congratulations to Danny if it is, but it sounds like Sesame Street. We have given him and Mark credit where credit is due, there’s one song where you can tell they pulled something up from within them and put it on record. Download If You Could See Me Now. There isn’t many points where you actually buy into the emotion in #3, I don’t think they have it as a band; perhaps the best they can offer is practically perfect polished pop with the odd rap and swear word for grit. It leaves you feeling like you’ve just heard a Politician interviewed, the sounds are great all the right things are there but you’re still not convinced. It’s not believable and it doesn’t really go anywhere but it’s pleasant enough and your Mum and Dad will probably love it. Yay. Words © Simon A. Moult 2012. Artwork and music included solely to illustrate the audio recording in question.